So loving the cooler fall weather! The garden, while still calling to me, doesn’t need constant watering and I now have the luxury to spend six-to-seven hours working in the studio. 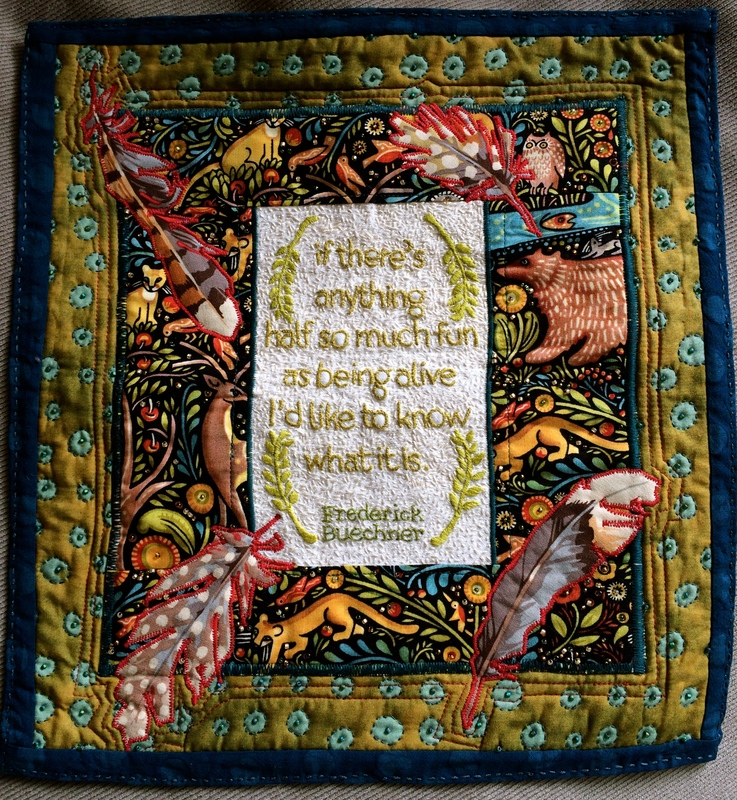 Seems like I’ve been stitching (on and off) this piece forever (or at least a good part of the summer). 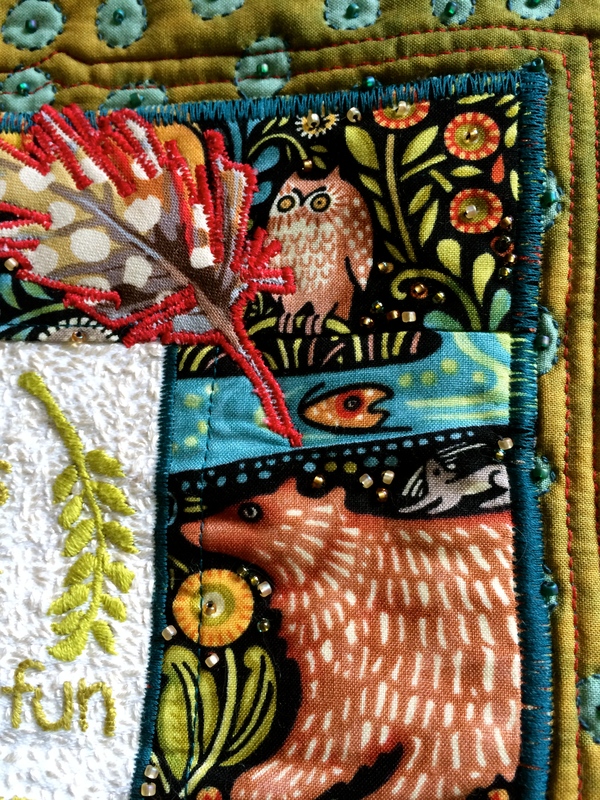 The animal fabric is by Julie Paschkis, who’s work always makes me smile. The feather fabric was the inspiration for my newest tattoo (I think it’s part of Kaffe Fassett’s recent range). 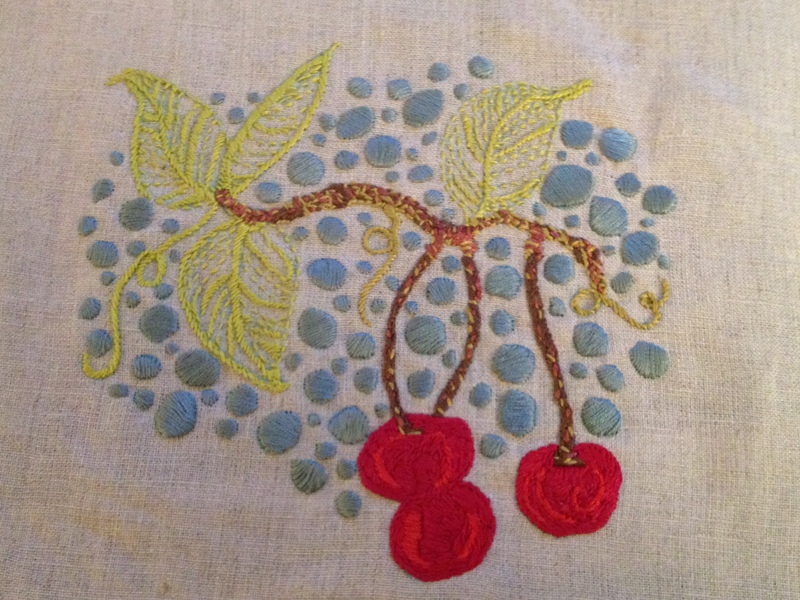 Marcia Derse created the dot fabric – I met her recently at Quilt/Knit/Stitch – love her work! 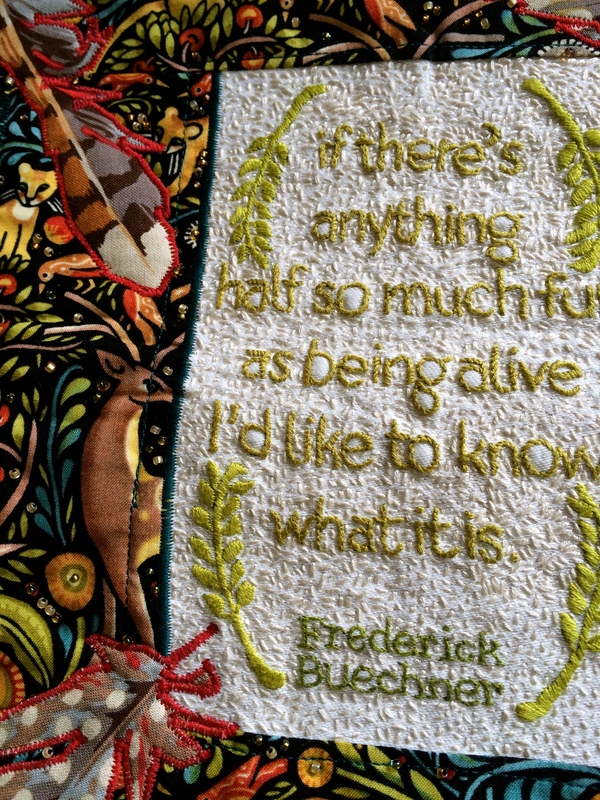 Searching the web for great quotations is an on-going obsession and I’m particularly fond of these words by Frederic Buechner. Such bright words called for sparkly beads, don’t cha’ think? Ironing and shadow box framing will come next and then this work will be for sale in the SHOP. 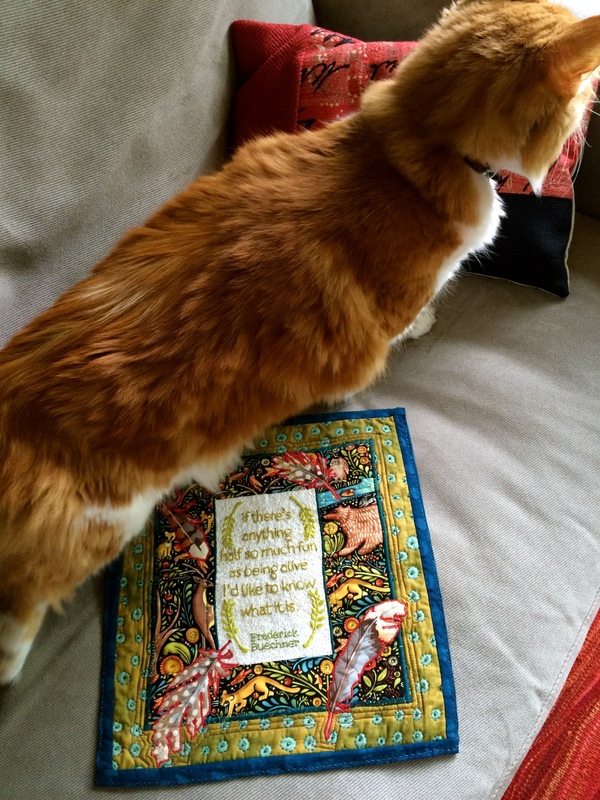 Henry was impressed with all my stitching until he saw a bird . 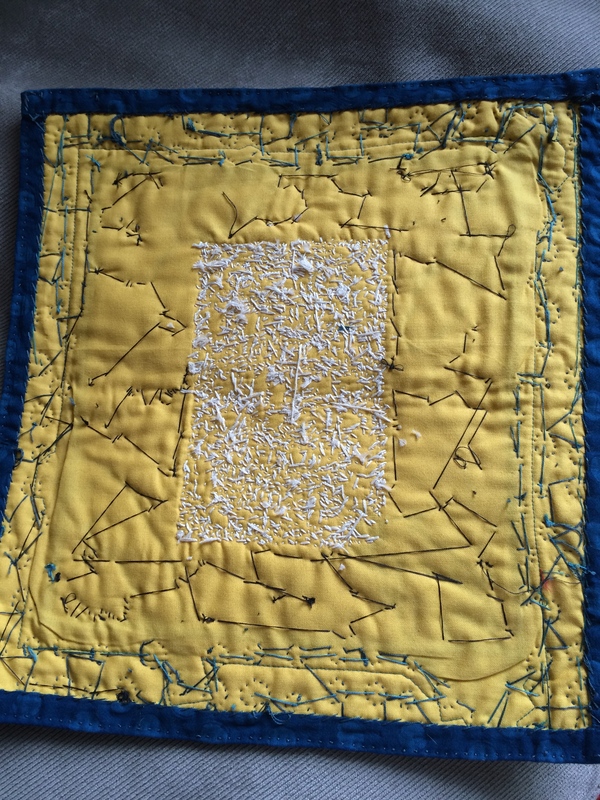 . .
Lots of little stitches . . .
. . . and glass beads! Needless-to-say, this is the ONLY time you’ll see the back! 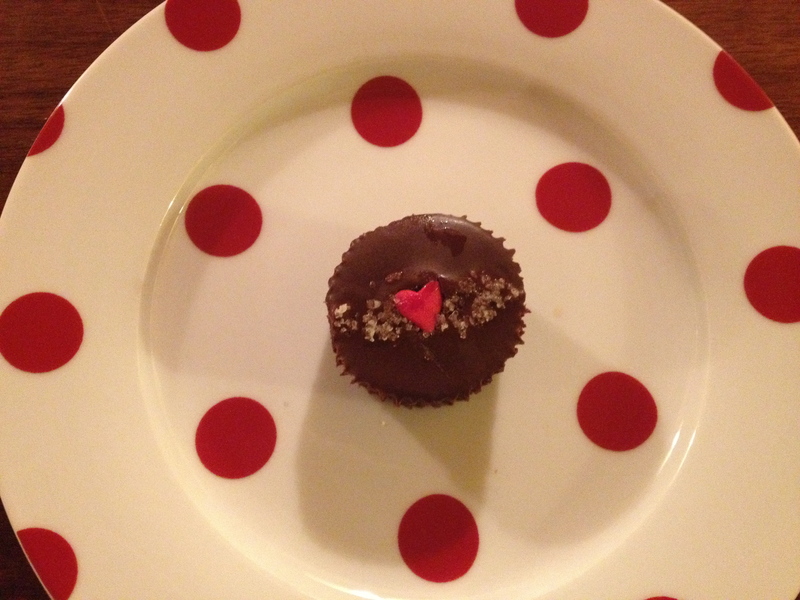 It’s week 15 of the 52 Photos Project and the prompt is delicate. Soft, ethereal, fragile or subtle are other options. Good words to transform into photographs. The delicate pattern of my mom’s wedding china (Avon by Wedgewood) evokes memories of special occasion dinners with grandparents and family friends. 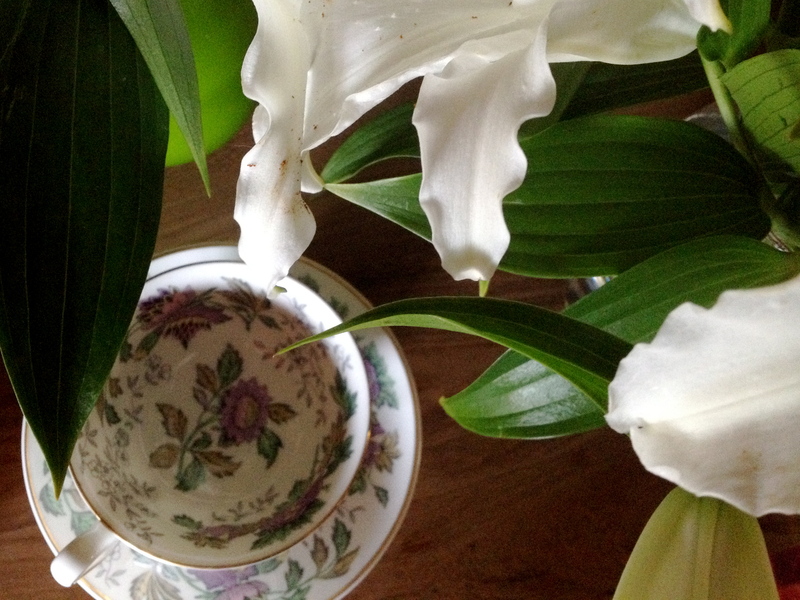 However, these Bianca lilies are not subtle, their scent envelopes the house with a spicy, sweet fragrance and the white flowers make quite a statement. Ethereal perfectly describes this wonderful sculpture at San Francisco’s de Young Museum. 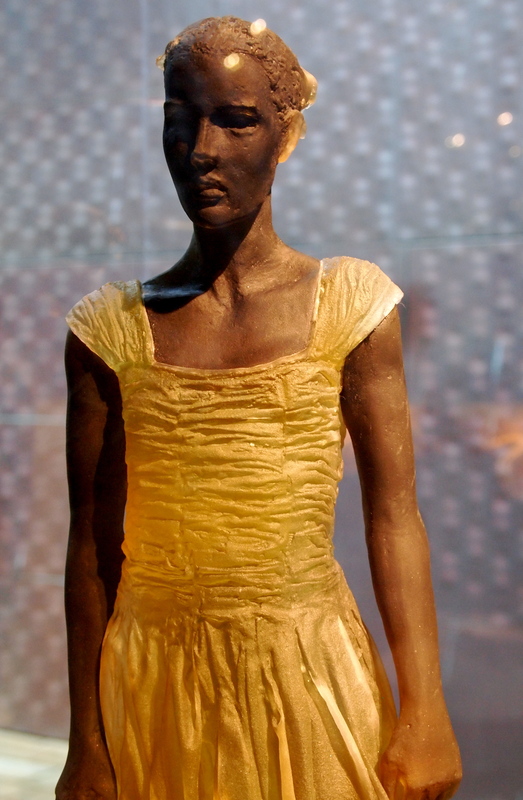 The hardness of the bronze and the softness of the dress so captivated me that I forgot to write down the artist’s name. 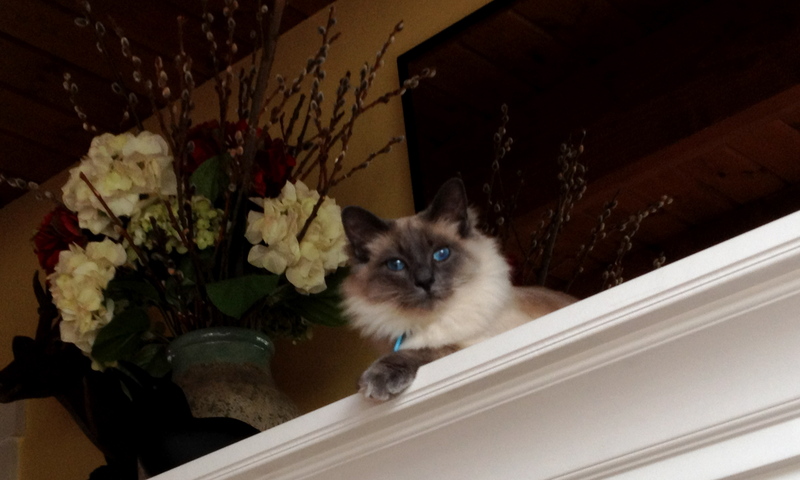 Miss Winnie Cooper is most definitely soft and leaping delicately on to and off of the mantle brings her great joy. I think that true blue flowers are always ethereal. 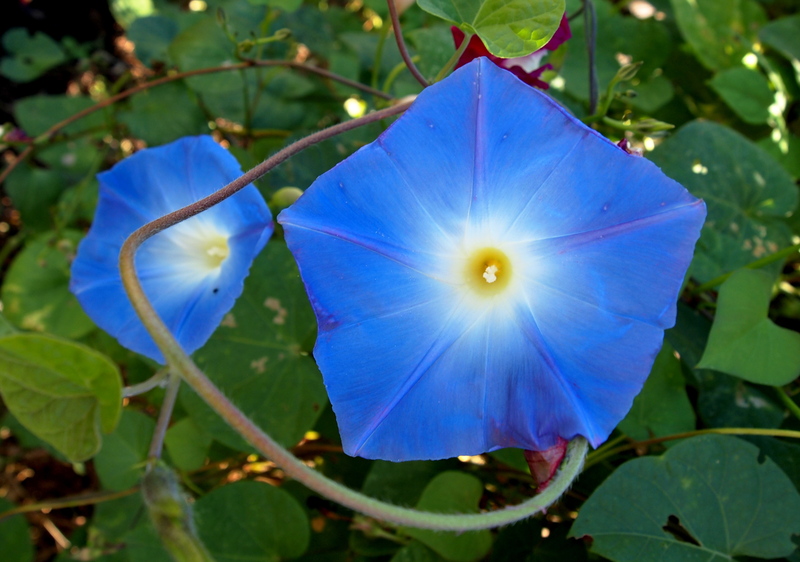 These morning glories seem almost too perfect to be real. 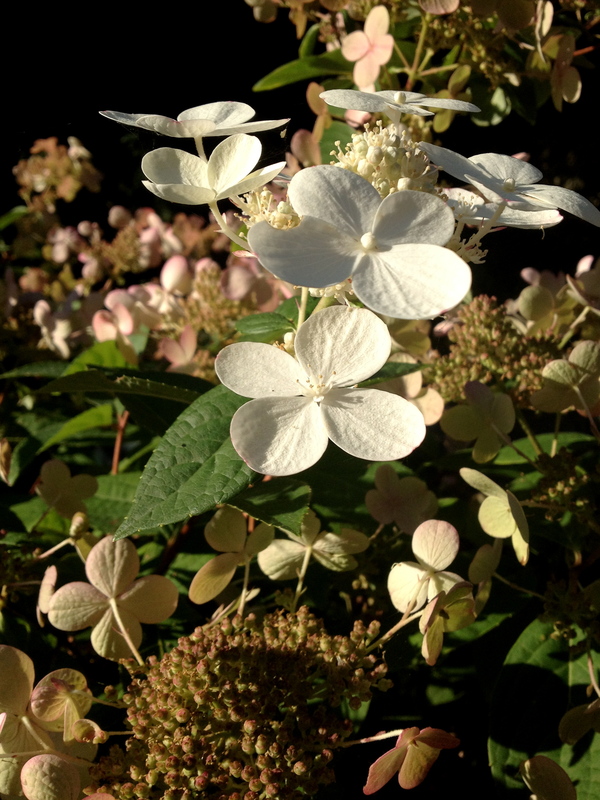 My garden is home to several lacecap hydrangeas and while they appear very fragile, these blossoms are quite hardy. I often think of this poignant saying, “Remember me when this you see, or I will be forgotten,” when I purchase abandoned photographs and letters at flea markets and garage sales. 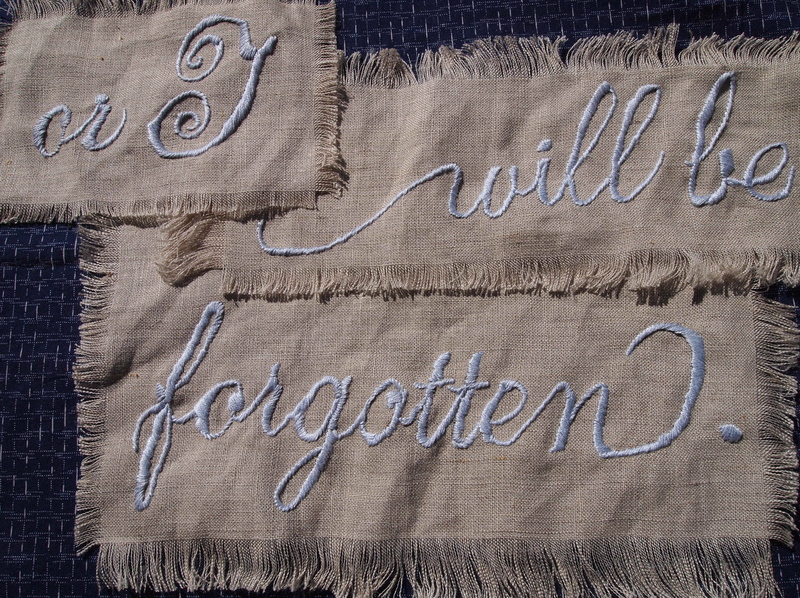 A not-so-subtle yet ethereal phrase that I embroidered on soft linen. If you know me, you know I LOVE dots. 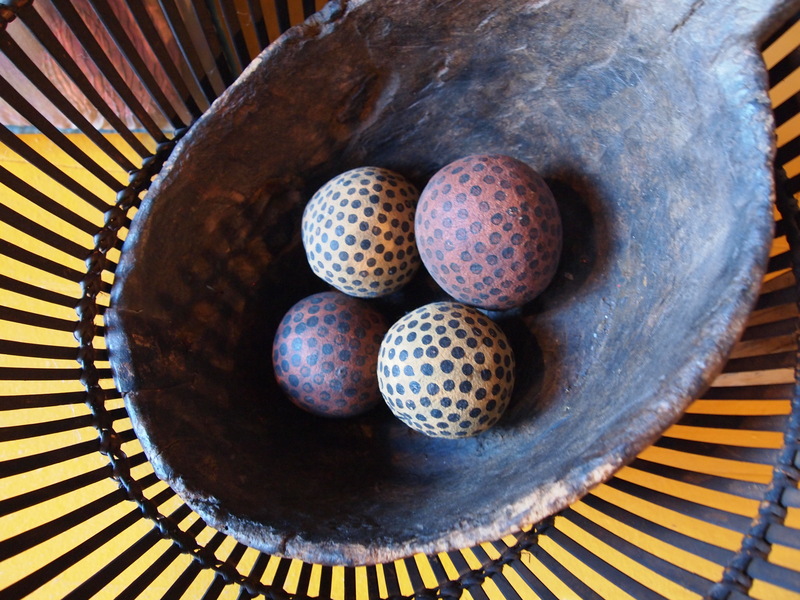 Full dots, empty dots, circles in any size, shape or form. 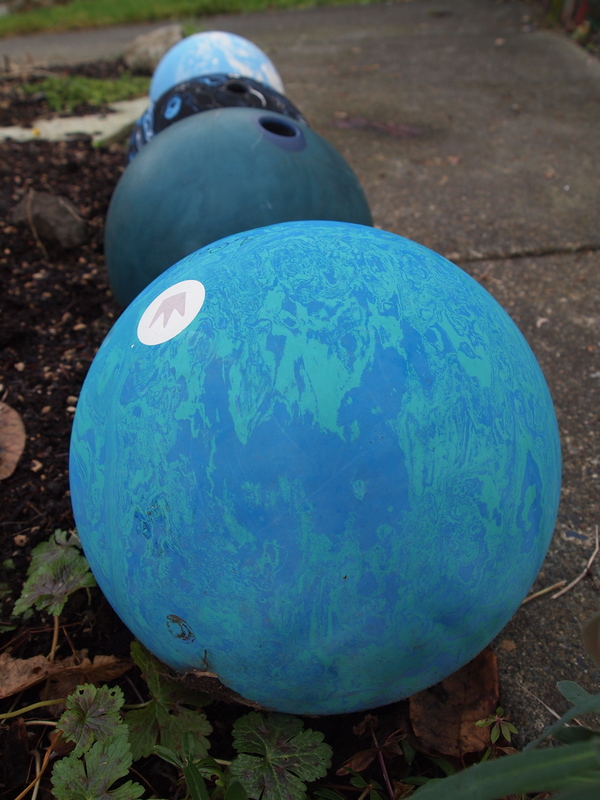 So this weeks’s 52 Photo Project prompt – CIRCLES – sure does float my boat! Dictionary.com has many definitions for circle, here are the first five. cir•cle [sur-kuhl], noun, verb 1. a closed plane curve consisting of all points at a given distance from a point within it called the center. Equation: x2 + y2 = r2. 2. the portion of a plane bounded by such a curve. 3. any circular or ringlike object, formation, or arrangement: a circle of dancers. 4. a ring, circlet, or crown. 5. the ring of a circle. Needless-to-say (at least in my humble opinion) these do not do the circle justice! Very dry explanations for an amazingly fabulous shape. 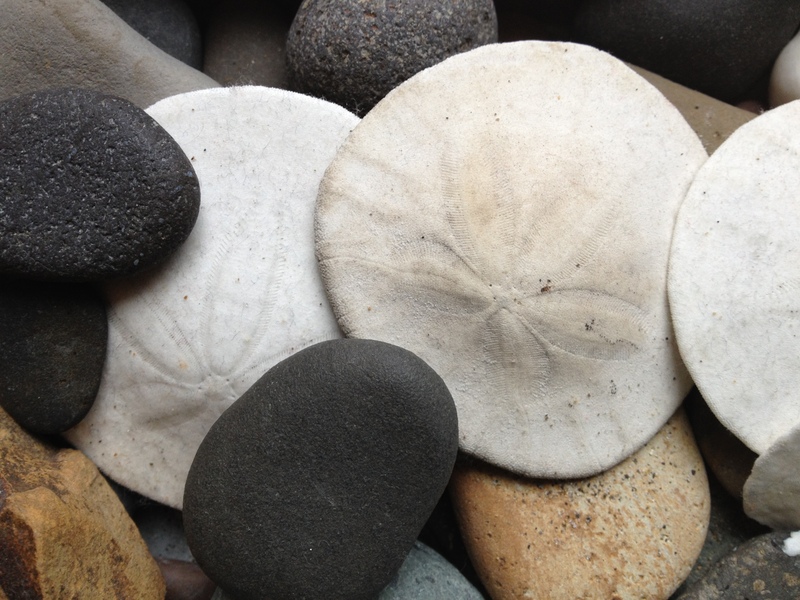 My favorite thing about circles, dots, ovals, anything round in fact, is that they appear to have no beginning or end. They are constantly continuing . . . rolling on and on. Circles are happy shapes; they invite touch and stir memories – of the sun, familiar faces, delicious fruits, bouncing balls and much more. All that round goodness in a closed plane curve consisting of all points at a given distance from a point within it called the center. 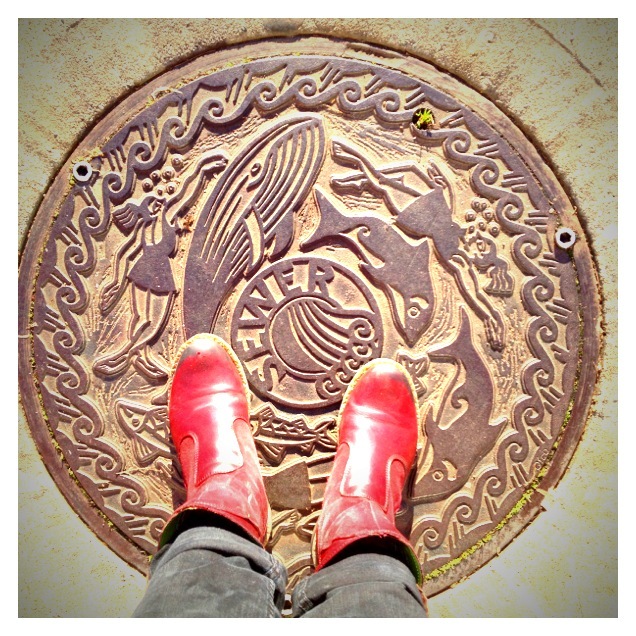 isn’t this sewer cover fun?